Fully SOC 2 and ISO 27001-compliant, Perimeter 81 offers organizations GDPR security that works. Find out how Perimeter 81 can help you achieve complete security and data protection for GDPR compliance. GDPR requirements include 160 different regulations on how you collect, store and use customer data, which is why finding an effective security solution is essential for compliance. Penalties for violations of record keeping, security, breach notifications, or privacy obligations can reach ten million euros, or two percent of income – whichever is larger. GDPR allows individuals in the EU to request a copy of personal data stored in organizations’ databases. They also have the right to be forgotten. 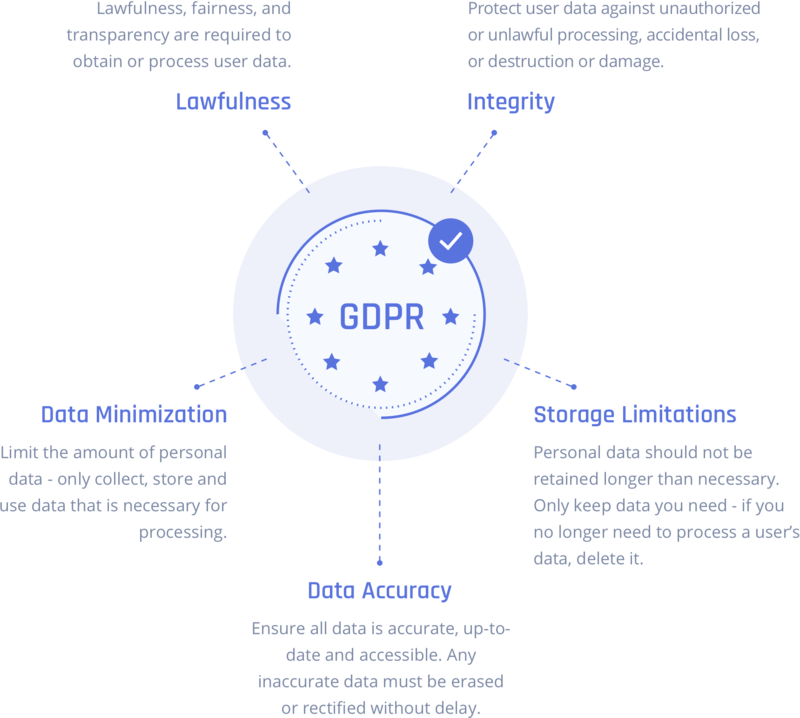 Perimeter 81 allows businesses to identify personal data bound by GDPR requirements, determine where it is located and secure these resources accordingly. Customize user access to the network to secure sensitive data with Perimeter 81. By assigning user roles to groups and securing resources with private servers, you can finally govern how data is used. Protect user data beyond EU regulator standards with a holistic security solution that encrypts transmitted data and secures access to the network both on-site and remotely. With Perimeter 81’s Activity feature, IT staff can monitor, report and respond to data requests and breaches. When you choose Perimeter 81, you can feel completely confident that you are using a service that meets GDPR standards. GDPR will drastically change the way businesses handle Wi-Fi security which is why we offer a fail-safe solution for organizations of all sizes. Once you install Perimeter 81’s client applications, you can rest assured that data passing over any network is secured with 256-bit bank-level encryption. Perimeter 81’s innovative Automatic Wi-Fi Security immediately shields data by automatically activating VPN protection when employees connect to untrusted networks. With granular access to cloud environments, we make GDPR compliance easy to achieve. Simple and easy to use monitoring, logging, auditing and security analytics allows you to implement secure, policy-based access management policies in the network. Supporting security practices include Two-Factor Authentication (2FA) and identity provider integration. We can help you meet GDPR regulations, simply and cost-effectively. GDPR violations related to processing, lack of consent, data subject rights and cross-border data transfers can cost companies huge fines. With GDPR in full effect, it’s important that businesses implement necessary security measures to secure customer data. With Perimeter 81, we make security simple and easy to use so that you can protect your data worry free.